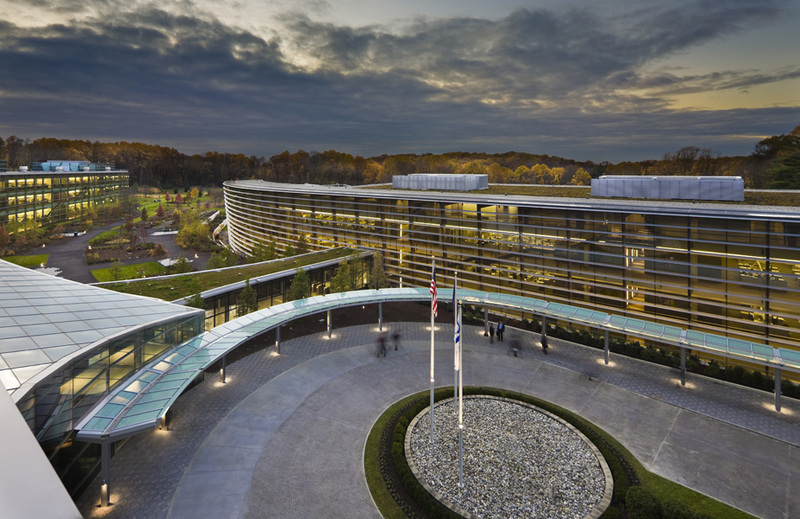 In 2010 SAP Americas proved their commitment to sustainability by expanding their North American headquarters on the Newtown Square campus and achieving certification as Pennsylvania’s largest “LEED Platinum” Building – the highest rating given by the U.S Green Building Council (USGBC). Hatzel & Buehler worked as part of this LEED Platinum project, by providing electrical construction to the 200,000 square foot office building, as well as a 130,000 square foot addition to an existing parking garage structure. Hatzel & Buehler’s scope of work included the installation of a 5kv substation and power distribution equipment; the installation of a 600 KW generator, ATS switch and emergency power distribution; the Installation of Quadlogic metering and integration to the BMS system; the installation of panelboards and branch circuitry, lighting, site lighting and of a Lutron lighting control system which includes daylight harvesting, shade integration, occupancy sensors and time clock controls. In addition to lightening protection and grounding, Hatzel & Buehler also provided a new fire alarm system with the integration of a smoke evacuation system, including the operation of louvered windows and security wiring and component installation.